I have been sick with a nasty virus folks, so my brain hasn’t been available to add part three of my posting. But antibiotics finally kicked in and I’m starting to function again, so on to the last posting on the quilting and binding of my Friendship Star quilt. 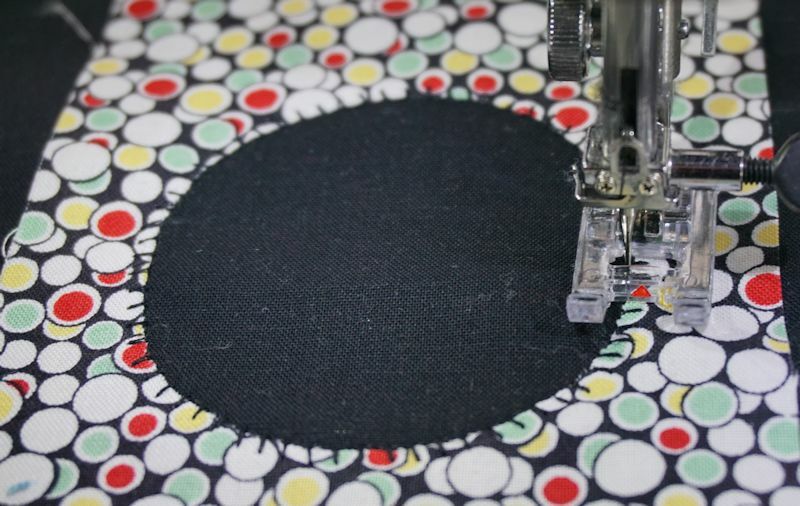 First, I want to talk about my challenge doing machine applique on the inside curves of a circle cut into the center of a rectangle block. Now I’m no expert at applique in the first place; only doing it twice before and only on the outer edges of circles. So wrapping my mind around sewing down the inner edges of a circle cut into a rectangle was a bit challenging for some reason! You can see the “messy” result below. Plus, my sewing machine allows me to choose “applique” stitches. The one above may also be known as a “blanket stitch” on other machines. 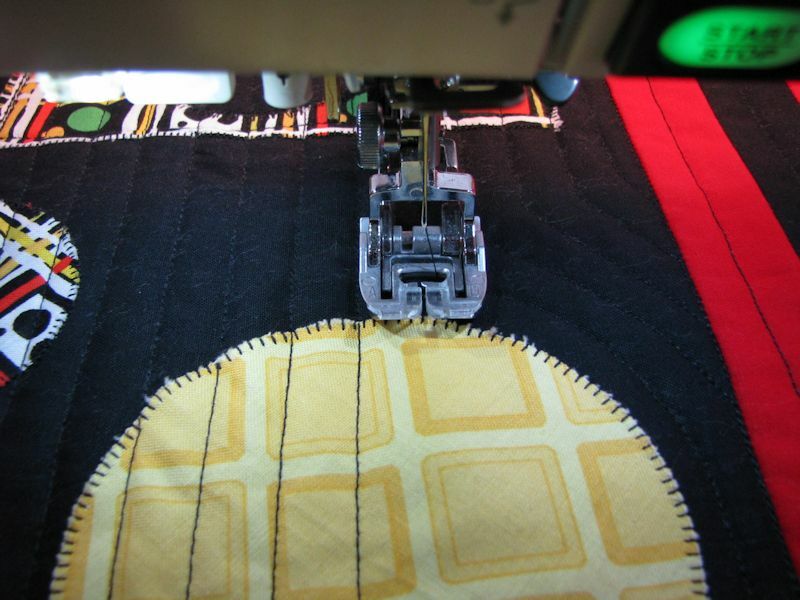 My machine also allows me to do “mirror images” of stitches, so basically, I could choose the blanket stitch that makes a stitch falling to the left, reverse that and make the stitch fall to the right or vice-verse just by pressing a button. That makes life pretty simple, huh? However I think I really just went too fast and lost control of my curves. I ended up missing some stitches and had to go around a second time. The stitches ended up looking more like a sunburst, with lines going out in random different angles instead of clean, more exact stitches as you would normally see on an outside curve. In the end, I was okay with this and considered it a “design element”, LOL. However I just had to try it again on another sample after I had finished my quilt, which actually turned out better. So again, the key is keep your needle as close to the inside edge as possible, go slow, stopping after two or three stitches then lifting your presser foot to readjust the position of your block so you can keep moving around the curve. The one above turned out better than the one in the quilt itself :). I am not the best at hand sewing so I have always sewn my bindings on by machine. There are several good tutorials on how to do that, but I recently came across a new one that I tried and liked the result better than what I had been doing. 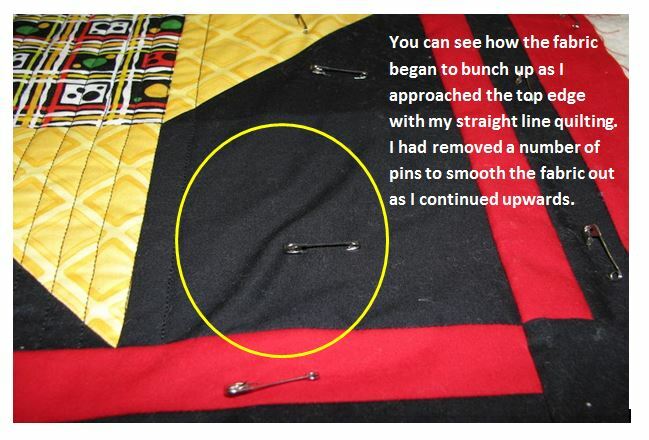 Normally, I was sewing the binding to the BACK of my quilt first, then to the front. This time I sewed it to the FRONT of the quilt first, and liked that even more. 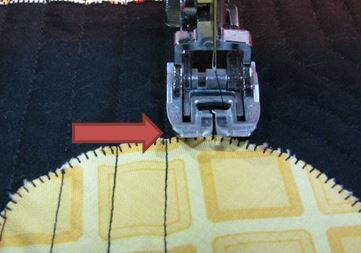 However, you have to feel VERY confident that you can sense, or feel where the folded over edge of the binding is falling in relation to the binding on the front (it has to fall past the stitching on the back) to know you are not accidentally sewing a very wonky seam or sewing into the front of the binding. It’s kind of scary because you can’t see whats happening on the front, but I found I could actually feel where I was and didn’t mess this up. Plus, if you are using a color of thread that matches the front of your quilt, it’s probably less scary. Here’s a link to an excellent tutorial on the Cluck Cluck Sew blog, a wonderful blog with great information and inspiration. I always use 2 1/2″ strips for my binding. Below is a sample of what mine looked like. Because I already had some straight stitching in the border, this additional line of stitching did not look out of place in my opinion. So part of making the decision to bind in this manner might depend on what else is going on in your front borders, or the color of your thread and how much it might stand out. So that’s it for deconstructing this quilt to provide a little insight on my thought process behind designing and quilting this project. I hope it may give you some ideas and tips as well. This entry was posted in Projects on March 22, 2015 by denmck. Part 2 on this topic is to discuss the center section of this quilt and my thought process for the quilting. Let’s start with the center star block first. I decided I wanted to straight line quilt on the diagonal to add some interest. I think you can tell how that turned out in the photo below. I laid out my starting line with a piece of painters tape in the center of my block. But I didn’t assume if I put the tape there it would line up well with the diagonal slant of the star points. So I took a long ruler and lined it up with the diagonal lines of the star points to see if the tape edge lined up correctly as well. I didn’t want the stitch line to be at a weird angle compared to the angle of the star points. I would notice it even if others did not, LOL. In this case the tape line actually was a tad off so I slide the ruler down so that the edge was close to the center but a line was still lined up with a star point angle, and adjusted the tape along the edge of the ruler. That made me happy. Lesson Learned: I could have just done that first rather than checking to see if the tape lined up after I placed it, (palm bump to forehead). Once I had my tape adjusted I lined up the edge of the foot and started sewing. This meant that I did not have a stitch line that ran smack down the center of the block, since my stitch line wouldn’t have lined up exactly from corner to corner anyway. I thought it looked fine IMO. Once that base line was sewn I lined up the edge of my foot with it and sewed the next line of stitching, and continued on lining up my foot with each subsequent stitch line. I sewed one half of the block first, then sewed the other half, moving away from the center, again so that I could make sure I was smoothing the fabric equally in both directions as needed. After the center block was done it was time to do the two flanking blocks. 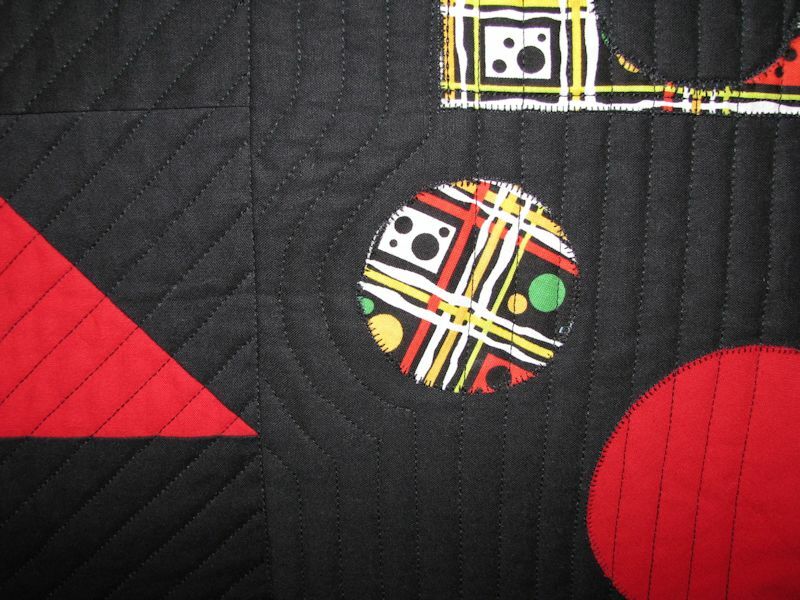 I decided to sew vertical lines in those blocks but to “echo” the outside edges of the circles. To accomplish that I again went to my long ruler and laid it over the circles. I followed the half-inch marks from the approximate center of one circle to the approximate center of the other circle to be sure the distance between the lines worked out okay. I then marked where I was going to start and end my vertical stitching lines with that trusty painters tape again. I then chose what I considered the starter line then added longer pieces of the tape to the little one to run the tape from top to bottom of the block. I left the other piece of tape in place as well so that I knew where I wanted to stop. 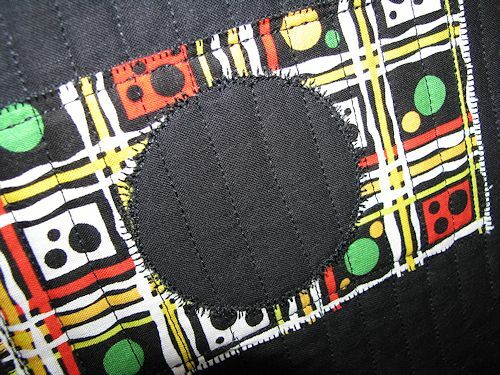 I sewed all of the center vertical lines first, running them through one half of each circle. Then for the second half of the circles I stopped my foot with the needle 1/2″ from the edge of the circle. I’m fortunate enough that my foot has two marks on it; one that is 1/4″ away from the needle and another that is 1/2″ away from the needle. So I can tell where I need to stop. If you don’t have a mark on your foot you can mark it yourself with a Sharpie (if you want it to be permanent) or a piece of tape. Also note – since this is a curved edge both marked lines on your foot will not touch the edge at the same time! The first line to touch the edge is when you stop. In the photo above that would be the line on the left edge of the foot. After I stopped at the edge, with my needle down I pivoted to place the edge of my foot on the edge of the circle, then slowly sewed following along the edge. 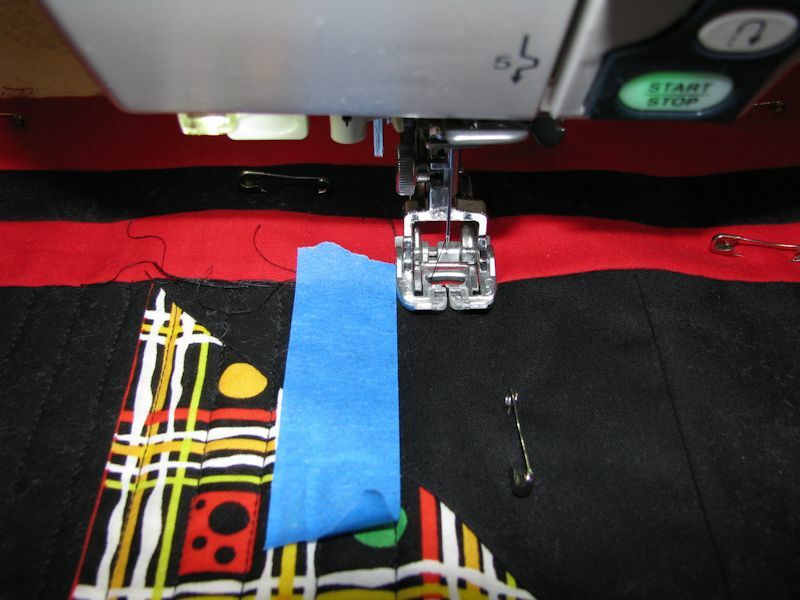 When I come to the previously sewn vertical line I stopped 1/2″ away so I can again pivot and line up my foot edge to follow the sewn vertical line to the bottom of the block. Just keep following your curved lines this same way until you have to stop to avoid crossing over into another block. 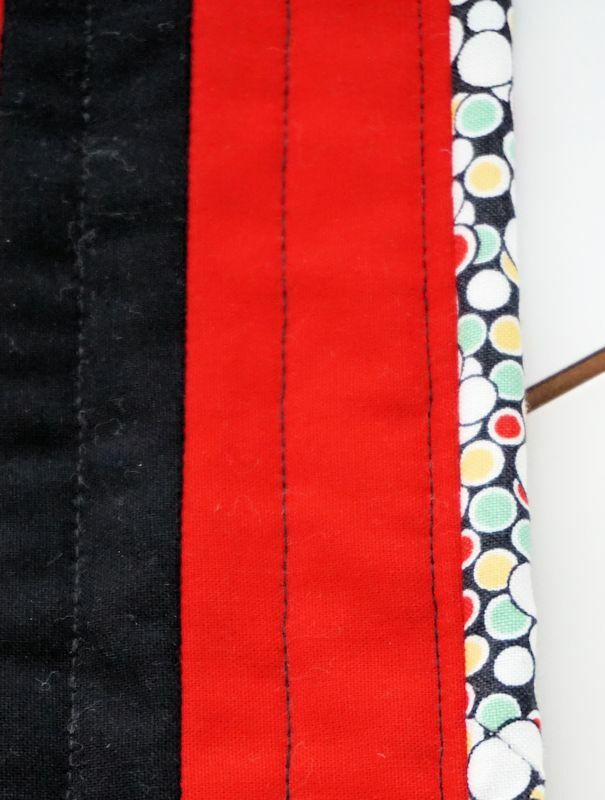 When you approach the border, or edge of your block you can simply stop your sewing line, cut your threads, then start back up at the bottom half of the curve or stitch in the ditch along the straight seam then pick up the curves again at the bottom. If your last stitched vertical line is a little more or a little less than 1/2″ from the side or border of your block, I don’t feel it really matters. Just stop stitching when you think it looks good! In some cases I think mine ended up being just a tad thinner than 1/2″ but I preferred that more than a larger gap between the last line and the side seam/border. Personal preference rules here. I hope sharing this process helps you to decide if you want to tackle echoing a curve within a quilt. My next posting will talk about how I did the machine appliqué on the inside curves of a cut-out circle, and machine binding. 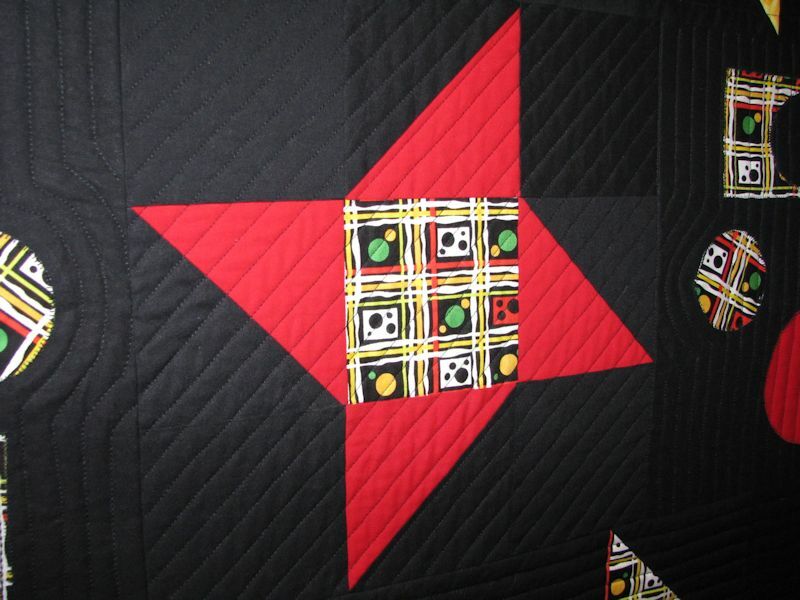 This entry was posted in Projects and tagged Friendship Star, modern friendship star quilt on February 23, 2015 by denmck. Lately I’ve been working on too many projects at the same time and made the commitment to get ONE completely done! So here it is; my Friendship Star quilt. The print fabrics in this quilt were purchased about three years ago during a guild fundraiser that was held at a sewing machine store I was visiting. Members were selling off fat-quarters and other small cuts from their stash. I really liked this multicolored print so bought the small amount they had, plus the complementary yellow print. After moving them around several times on my shelves while looking for other things, I decided to dive in and use them for something. 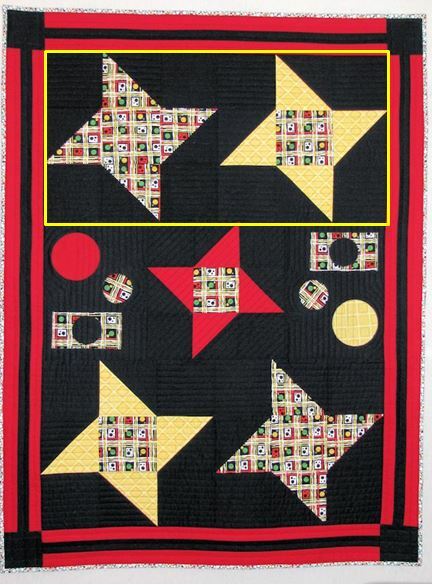 The “something” is a Friendship Star quilt that finished at 37″ x 47 1/2″. Patience, patience, patience. That’s what it takes to do straight line quilting :). To plan the quilting I decided to tackle it by sections. 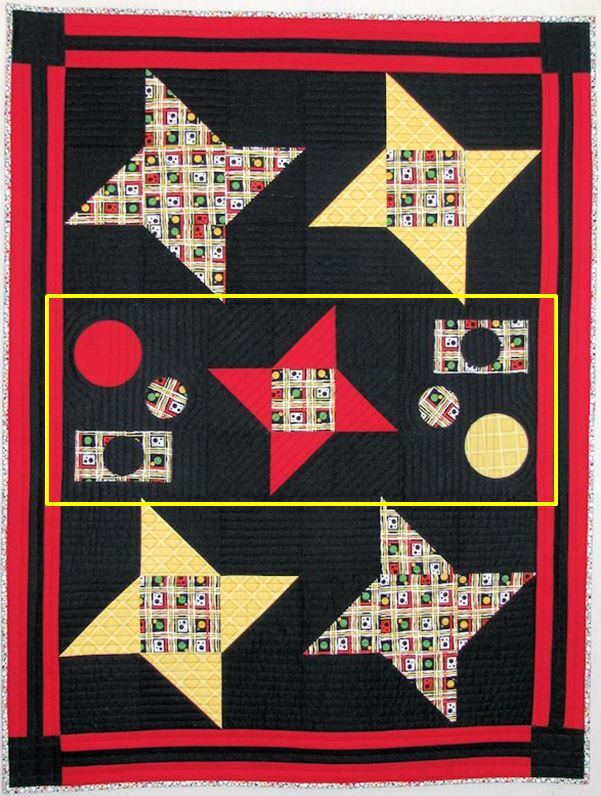 The top and bottom sections of the quilt are straight horizontal lines quilted 1/2″ apart. 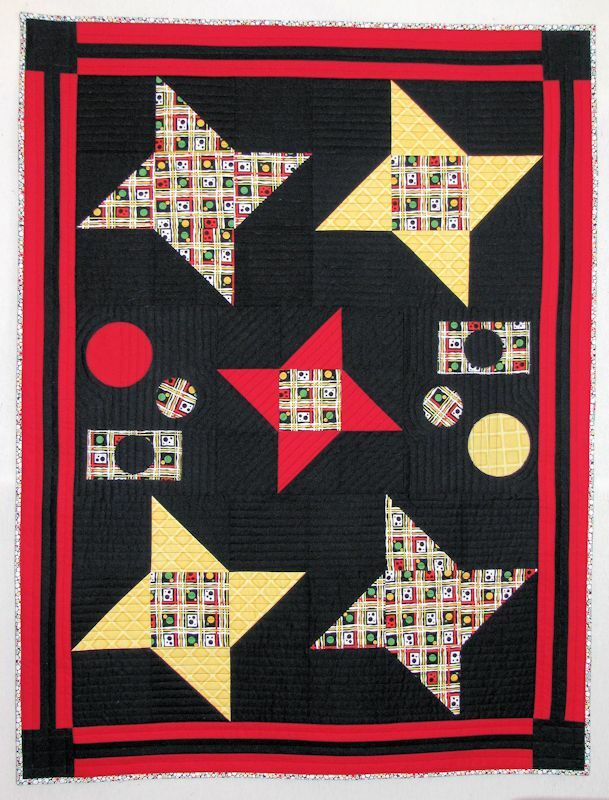 The middle of the quilt is made up of three blocks; the center star flanked by squares on which I appliqued circles and a rectangle with the center cut out. 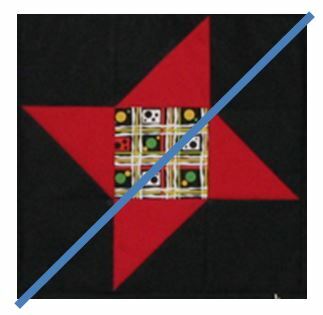 The center star block was quilted with diagonal lines 1/2″ apart. 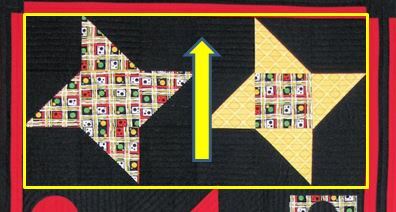 The two blocks with applique consist of 1/2″ apart vertical lines, but on one side of each circle I opted to “echo” the curved edges. 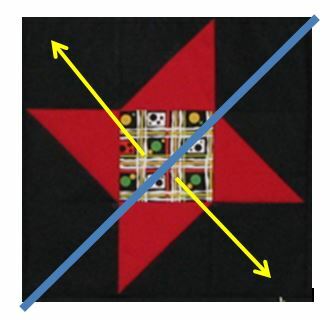 Step 1 – I measured the size of the area I wanted to quilt with the horizontal lines. From the top to the bottom of the first section, it equaled 14.5″. 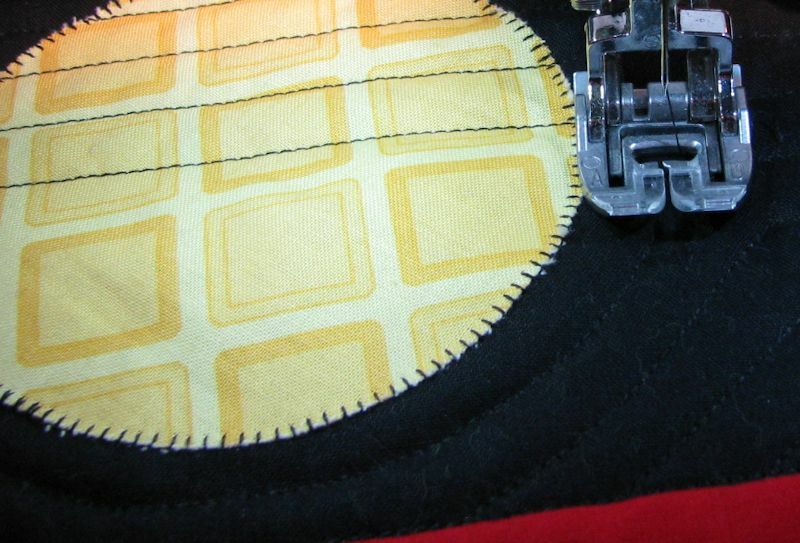 So it was easy to tell I could sew lines of stitching 1/2″ apart and it would fill the space just fine. 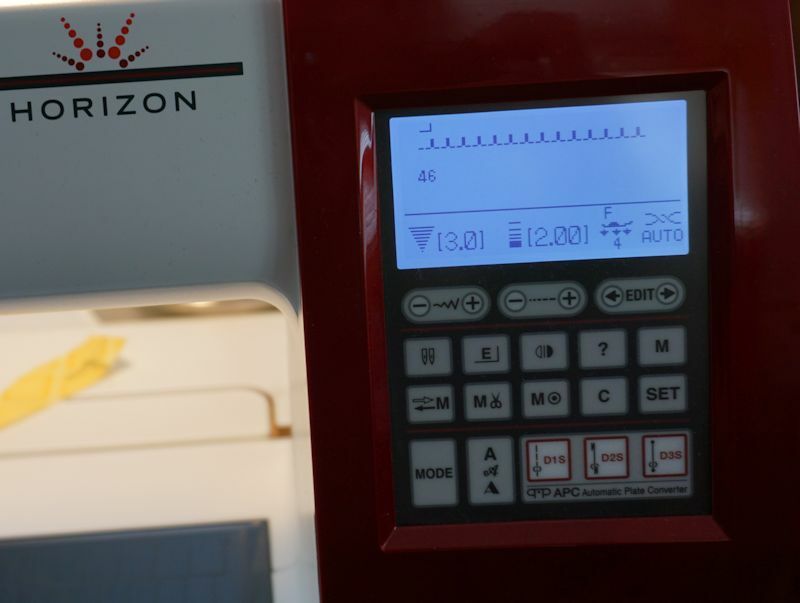 Step 2 – My sewing machine lets me adjust the needle position. So my plan was to use the side of my foot as my guide, adjusting the needle position so that there would be 1/2″ from the side to the needle. As fate had it, I didn’t need to adjust the position at all. In the center position it measured 1/2″ from the side of my foot. So I lined up the side of my foot along the bottom seam of my section and started stitching the bottom row first and worked towards the top, lining up the side of my foot with each line of stitching as I moved up the quilt. My thought was that I could continue to smooth out the surface of the quilt as needed by working from bottom to top. 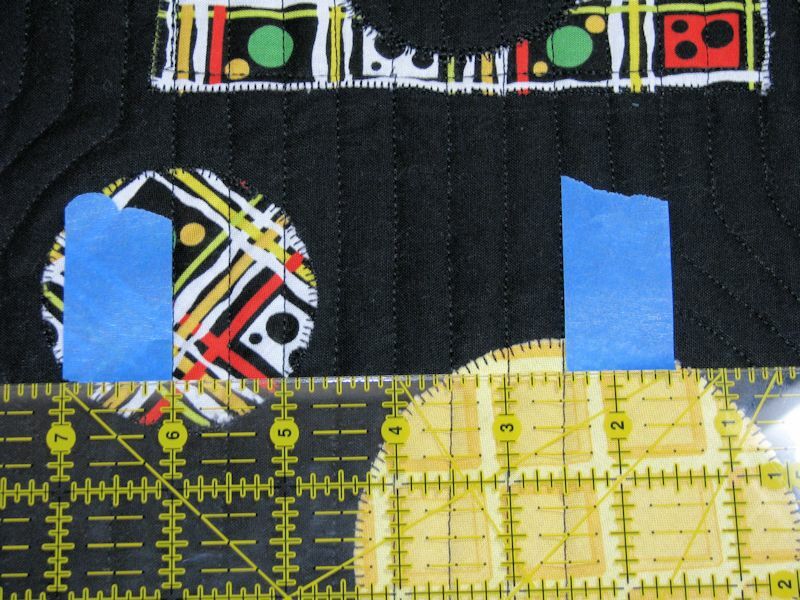 No matter how well you pin, once you start quilting the fabric will always shift somewhat. 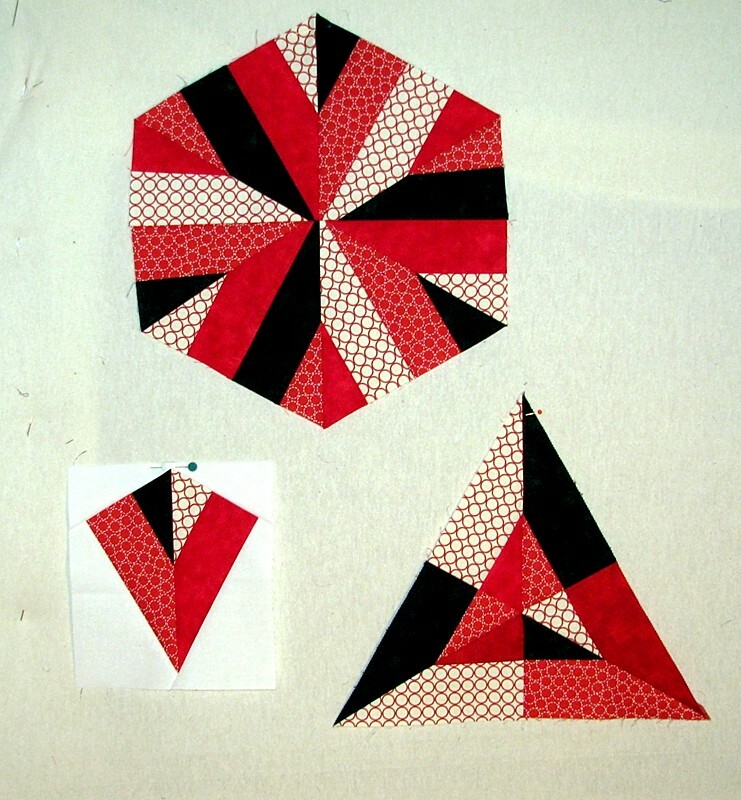 I followed this same process on the bottom section after I finished quilting the middle blocks. As careful as I was trying to keep my lines straight, I suddenly noticed I was curving my lines at the beginning of some of the rows! I think what happened is that as I tried to set my needle at the right starting point for my line, I shifted the quilt a little at one point, then continued to follow that “off” line for a few more rows until I noticed my error! So to correct that going forward, I took a small piece of painters tape and lined it up with the edge of a straight row so that I could place the edge of my foot against it and know I was starting off correctly. IMPORTANT TIP: Look at each line after you’ve sewn it to be sure if something got “off” you can correct it for your next row. I never felt any wobble I made was bad enough to rip out. It keeps things real…right? So that’s how I approached my horizontal straight-line quilting. 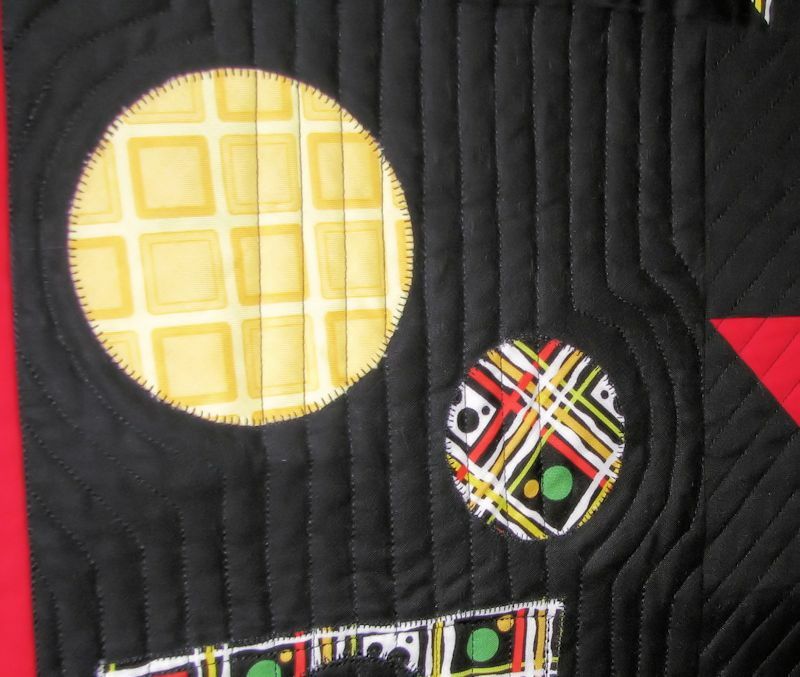 Part 2 will discuss the diagonal quilting and circle echo technique I used plus the adventure of doing machine applique on inside curves of a circle. Part 3 is on the machine binding technique I used. 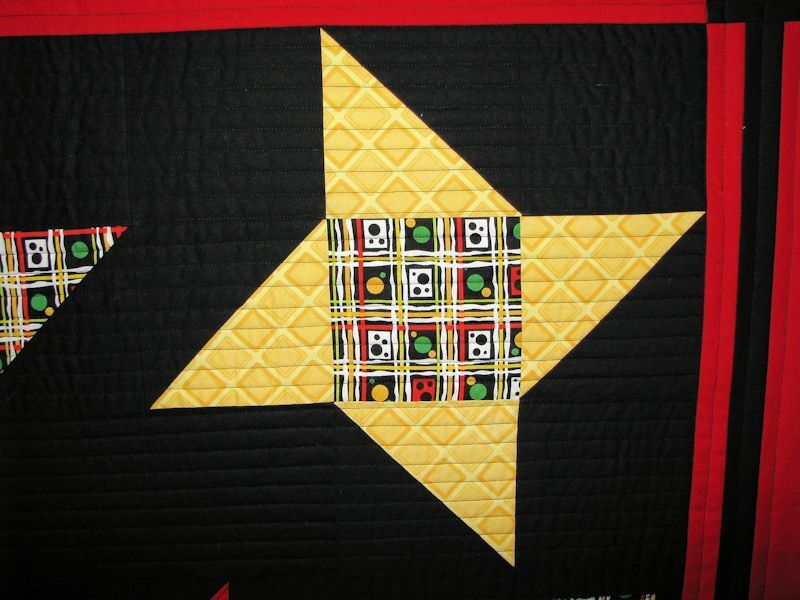 This entry was posted in Projects and tagged Friendship Star quilt, modern friendship star quilt, straight-line quilting on February 21, 2015 by denmck. Yesterday I got a much-needed new computer. I cannot tell you what a difference it has made so far in just about everything I use it for! Unfortunately, it took me a lot longer to get everything set up and all my files transferred than I thought it would. None the less I managed to get my tutorial written and posted before the weekend was over; as promised! 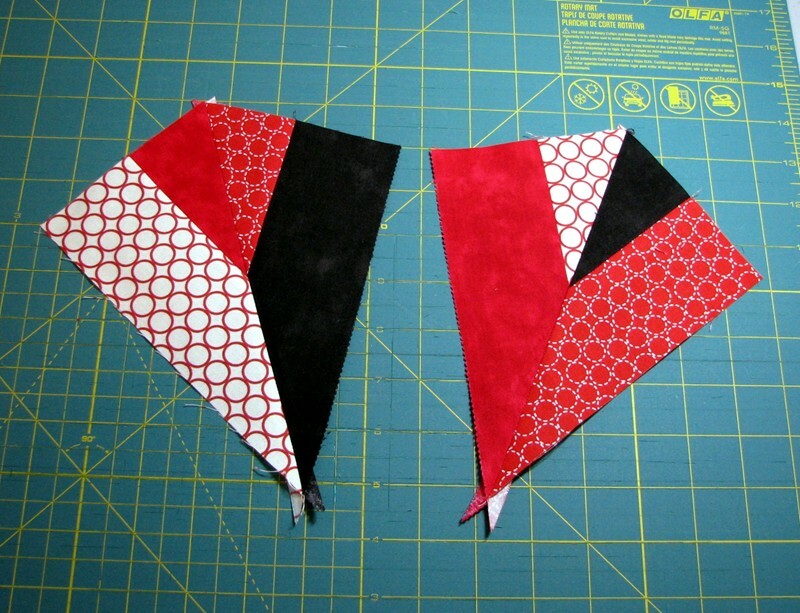 Check out my Tutorial page for how I made the kite shape from a recent experiment. This entry was posted in Projects on January 11, 2015 by denmck. This entry was posted in Projects on January 9, 2015 by denmck. I have mentioned in other posts that many times I will make a test block for a quilt idea, take a picture of it, then use Microsoft Word as a way to preview possible design layouts. I have been considering making a video on how to do that, and because of a request (and all my Christmas shopping and wrapping is done) I decided to give it a try. 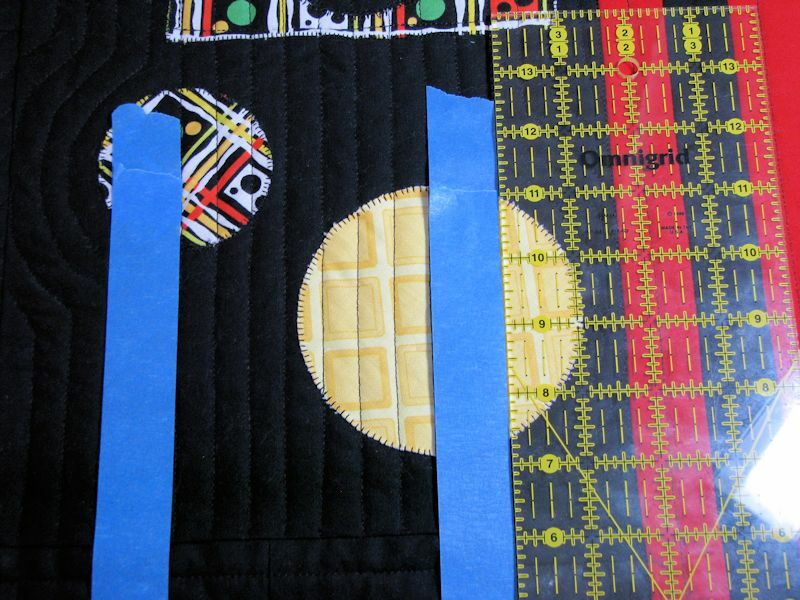 This will work whether you are using just one block, or more than one in your quilt idea. Just take one picture of each test block to insert in your Word document, and copy as many times as needed. As you’ll see I am not yet an expert with video editing software, but I believe my effort is acceptable, LOL. Pardon some of the awkward transitions! 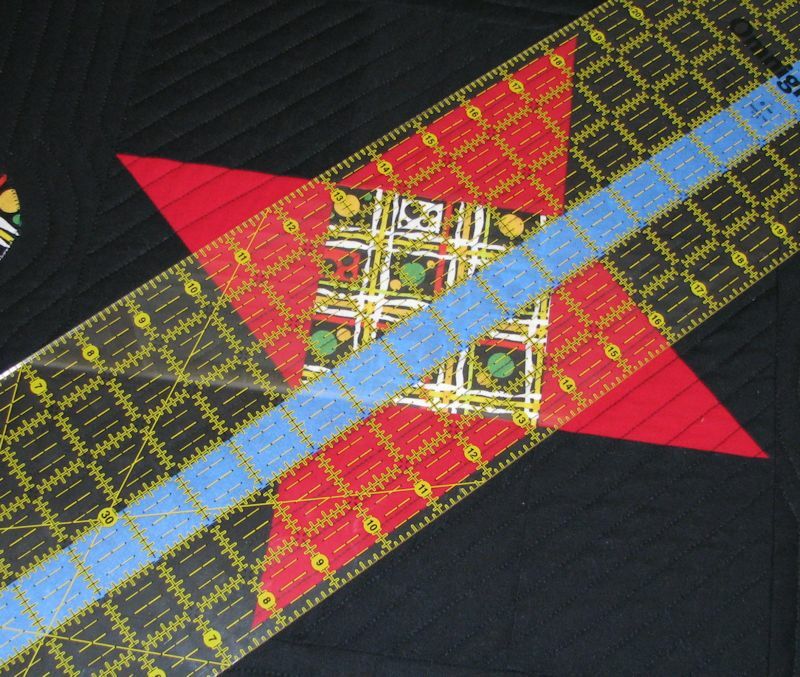 This entry was posted in Projects and tagged design wall, designing quilts, quilt design, quilt design wall, virtual design wall on December 20, 2014 by denmck. It’s come to my attention that a lot of people like to use bloglovin’ as a source to easily follow blogs. So I added a button in the right menu. I hope that helps others interested in following me to use their preferred method. This entry was posted in Projects on December 20, 2014 by denmck.